Baby, its cold outside. China is latest victim of plummeting global temperatures. Some sporadic reports of areas potentially reaching as low as -100 degrees F. Take precautions if you live there! Northern China is experiencing extreme cold this week, with temperatures lower than minus 43 degrees Fahrenheit measured in Heilongjiang Province. The province was under an orange alert, the second highest of the country's alerts, Monday through Wednesday because of the dangerous temperatures, according to local news site, Ecns.cn. Locations in Hebei Province, including Shijiazhuang, were under a blue alert on Wednesday. People from Hulunbuir in the Inner Mongolia Autonomous Region to Mohe City, China's northernmost city, took selfies of freezing eyelashes, eyebrows and hair as the temperatures plummeted. Tourists from southern China ventured north to see snow and experience the extreme cold. South China Morning Post reported that the cold caused frost fogs, dropping visibility to less than 328 feet in Mohe City. According to the provincial observatory forecast, the cold spell is likely to last in the region until Friday, and "may have a negative impact on local agriculture, transportation and logistics sectors," xinhuanet.com reported. Video is pretty neat. At minus 40 degrees F, hot water instantly freezes when tossed into air. Rare ice fog gripped the Chinese city of Mohe in the north of the country after temperatures plunged to a bitter -43.5C on December 6, according to Chinese media. Videos emerged on social media of people throwing water into the freezing air, causing it to turn to ice immediately. Ice fog only occurs in the world's coldest regions, as water droplets suspended in air can remain in liquid form down to temperatures as low as minus 40 degrees Celsius. China is latest victim of plummeting global temperatures. Make that plummeting local temperatures. Global temperatures today were 0.3°C above the 1979-2000 average. Let's be specific with apples-to-apples comparisons. Is the November 2018 global lower atmosphere temperature higher or lower than November 2017? How about 2016? How about 2015? The answer, of course, is lower. Temperatures have been dropping quickly globally. We are in the middle of one of the fastest drops since the satellite data began. We are back down to levels seen in the early 2000's. That is nearly 20 years. Sure, it isnt like the record minimums of 1970s and 1980s. But it isnt far off either. China has seen a widespread plunge in temperature as the country observes Major Snow - one of the 24 solar terms of the lunar calendar. Major Snow, the 21st solar term, falls between Dec 7 and Dec 21 this year. During the period, the snow becomes heavy and begins to accumulate on the ground, and the temperature drops significantly. The temperature in Beijing hit its lowest this winter at-8 C on Friday morning, according to www.weather.com.cn, a news portal for the China Meteorological Administration. The freezing temperature is coupled with strong winds during the daytime, making it one of the capital's coldest Major Snows in almost 70 years, according to the administration. The Beijing meteorological center had issued a blue alert on Thursday for continuous low temperatures, which is expected to last until the weekend and could plunge below -10 C.
The mercury in most parts of North China's Hebei province also plunged to-10 C on Friday, and there was also a big drop in temperature in Northeast China's Liaoning province and East China's Shandong province on Friday morning, with the drop ranging from 6 to 10 C.
The freezing temperatures are not limited to the north. The observatory has urged the public to make necessary precautions against the upcoming weather changes. It also renewed a blue alert for the cold wave, the lowest warning on the country's four-tier weather warning ranking system. Check out the neat video of "heaven-like" fog in China at bottom of article Dangerous but stunningly beautiful. A cold front accompanied by snow chilled northeast China's Heilongjiang Province, east China's Shandong Province and northwest China's Gansu Province, sending temperatures down to minus 30 degrees Celsius in some regions on Wednesday. The mixture of extreme cold temperatures and snow made for a breathtaking snow scenery but also disrupted local traffic. We already had that discussion in another thread. Your graph there shows that global temps are down from their record highs of 2 years ago, and I find this completely unsurprising because the graph is full of similar ups-and-downs lasting several years. What I take issue with is your statement that "China is latest victim of plummeting global temperatures." We've all seen scientifically-illiterate media reports blaming every heat wave and drought on global warming. Regional weather events with timescales of days to years are not equivalent to global weather/climate changes with timescales of decades to centuries. The same argument applies to the China/Mongolia/Siberia cold snap. 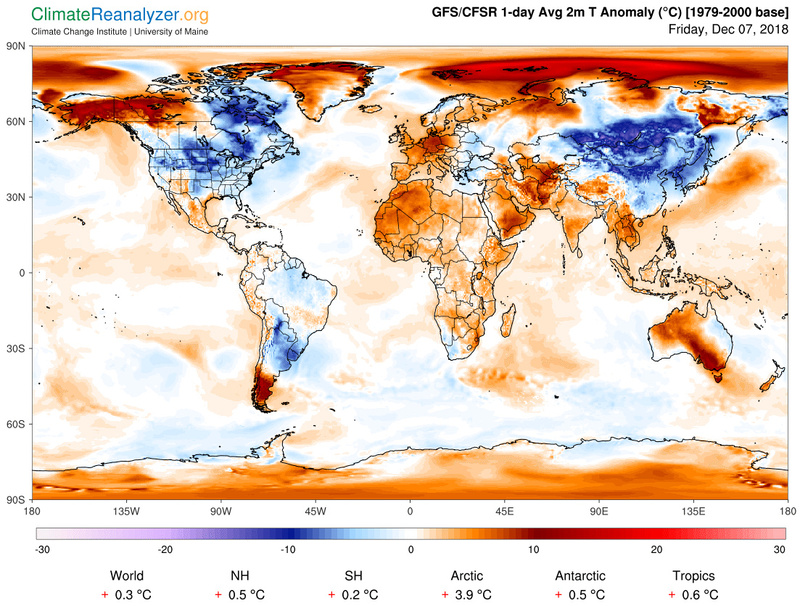 On Dec 7th, the unusually cold bits of the planet were that region, plus eastern Canada and the northern Great Plains, plus Uruguay and surrounding areas. The whole rest of the Earth was near-normal or above-normal. If you look at temperature and wind maps, it's clear that Arctic air was pouring south into the two chilly regions of the Northern Hemisphere. The North Pole was literally warmer than some parts of Siberia. Was this caused by a 2-year global cooling trend? Maybe. But that doesn't explain the similar "polar vortex" conditions we've seen in previous record-hot years. It has been proposed, but not proven, that warming in the Arctic increases the likelihood of these outbreaks of Arctic air into temperate regions (as previously discussed in this thread). Whatever the cause, as preppers, yes, we need to prepare for bitterly-cold winters. Again, that is not apples-to-apples comparison. It is very hard (practically impossible) to show any given localized weather event (hurricane, tornadoes, draught) or its intensity is caused by a change in global temperature. But geography temperatures are by definition included in the global temperature. Mathematically, the global temperature is the average of the temperatures over the globe. So when the global temperature goes up or down, it means that some locations are going up or down (mean value theorem of calculus). So we can absolutely say that if global temperatures plummet, that its plummeting in China and US are part of that trend. Now interestingly, there is a small, non-zero chance that all the change is over sea rather than land. So, technically global temperature could plummet without the temperature in any country following suit. 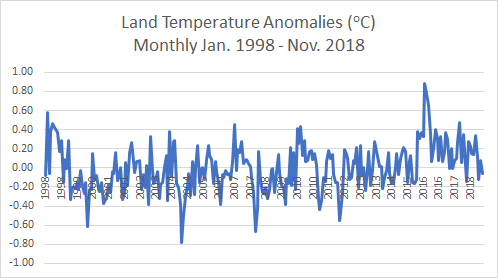 Out of curiosity I pulled 20 years (and 2018 to date) of monthly global and land temp data from the satellite sets. 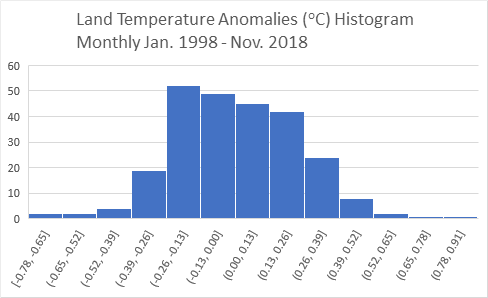 I subtracted the average of the data from the respective values to create temperature anomolies. I then regressed them to each other. Here is what the scatter looks like. 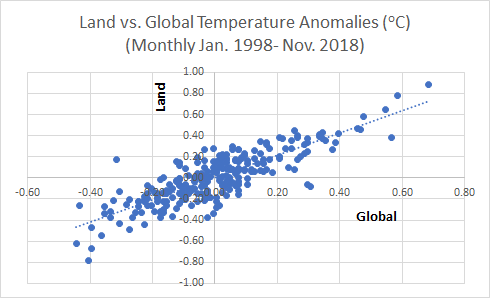 So, we can clearly see that generally the land component of global temperature and overall global temperature go in step (correlation 0.85 so about 70% of variance in land temp reflects global trend). Now here is a key chart pulling out just the December data (recalculating the anomolies for that subset). I put a red dot where if the trend continues December 2018 will fall (we will have the actual data first week of January). 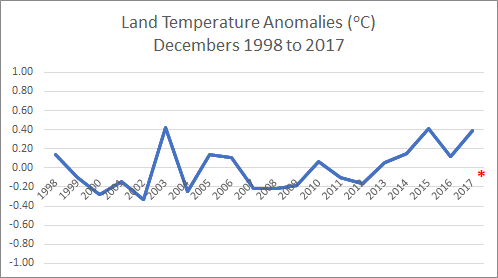 Land Temperatures are moving in line with this global trend. This is not just a "drop off record", it is trending below two decade averages. We are seeing this drop manifest in multiple places around the globe (China, US, etc). Friday was one of Beijing's coldest December days on record as temperatures were held to just shy of 6 below zero Celsius (21 F). Biting winds created dangerously lower AccuWeather RealFeel® Temperatures of 18 below zero C (zero F). "Temperatures have been held under 4 below zero C (25 F) on only seven December days since 2000," according to AccuWeather Senior Meteorologist Kristina Pydynowski. "Out of those days, only two had high temperatures near 6 below zero C (21 F)." A high near 4 C (40 F) is more common in early December. Similar weather gripped Seoul, South Korea, on Friday. The last time both cities failed to have a high temperature above freezing was Feb. 11 and 12. "Friday's high temperature was around the day's average low of 4 to 6 degrees below zero C (21-24 F) for each city," according to Pydynowski. Temperatures will remain well below normal this weekend with areas from Beijing to Seoul again failing to reach 0 C (32 F) for a high temperature. Please prepare now, Hong Kong. It is going to be cold and very wet. Hong Kong woke to a cold Monday morning with some areas seeing temperatures as low as 7.9 degrees Celsius, as the city’s official weather forecaster predicted even colder days ahead. The lowest average daily temperature recorded in 2017 was 9.8 degrees on December 18. It isnt over yet, record lows still being recorded. Below-normal temperatures are expected to persist across central and eastern parts of China from Monday to Wednesday after record lows for early December were set at seven national weather observation stations on Sunday, forecasters said. An observation station - one of the seven - in Pinggu district, Beijing's northeastern areas, recorded a new low of -15.8 C around 2 am on Sunday, the Beijing Meteorological Service said. It added that the mercury in the city's Tanghekou town plunged to a record -21.8 C on Saturday, and that 15 other weather observatories in the city saw their coldest early December in 10 years over the weekend. Record lows have also been recorded in Jiujiang, Jiangxi province, and in Xianning, Hubei province, the China Meteorological Administration said. As frigid air continues to flow south, subzero temperatures will reach parts of Jiangsu, Zhejiang and Anhui provinces, as well as the southwestern province of Guizhou, the administration said. Since the first national blue alert for cold this winter was issued on Dec 4, large parts of China have been shivering in frigid temperatures, some accompanied by strong winds and snow.